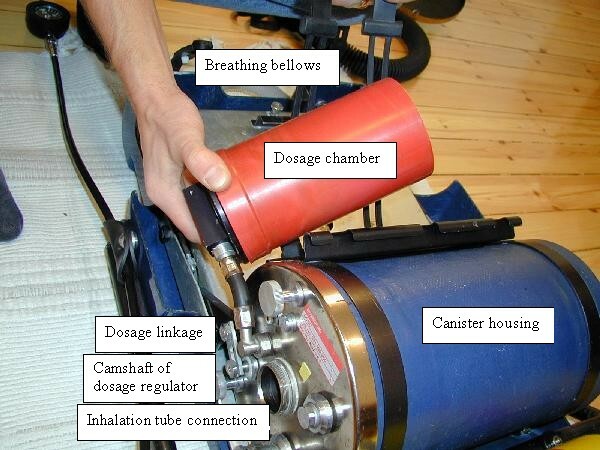 The DCSC controls the pressure of the dosage chamber in relation to the bellows position. This means that a change of bellows angle (i.e. volume) will either increase the dosage chamber pressure (i.e. fill it with gas from the Nitrox tank) or lower the chamber pressure and thus empty the over pressure into the breathing circuit. Thus the amount of added fresh gas will be proportional to the bellows movement and thus the ventilation of the diver. The angle of the breathing bellows is transferred to a camshaft in the dosage regulator via a linkage system (see separate picture). Since the angle of the bellows is proportional to the volume the rotation of the camshaft of the dosage regulator will be as well. The key component, the dosage regulator, is a pressure regulator with venting capabilities, i.e. the ability to reduce the pressure by releasing the intermediate pressure to the ambient. When the diver inhales the bellows volume decreases and the camshaft is rotated so the spring tension is increased, the membrane is pressed down thus opening the supply gas inlet valve until a new intermediate pressure equilibrium is reached. The intermediate pressure of the regulator is thus increased and the dosage chamber is filled with gas to a pressure proportional to the position of the bellows. When the diver exhales the bellows rises and the tension of the regulator spring decreases, the membrane is pressed up and the upper valve opens to reduce the intermediate pressure by releasing gas from the intermediate pressure dosage chamber into the breathing circuit. All material on this website is copyright 2003 by Åke Larsson. All rights reserved. Thanks are due to Peter Southwood for ideas and helpful criticism!